Customizable procedural spherical dissolve shader for Unity3D, for all your customizable procedural spherical dissolve needs! We don’t need to care about UVs and seams. The effect is consistent among different objects. They are all affected equally. Quality is also scale-independent. It is a more computationally expensive method. The dissolve effect follows a spherical shape, meaning it can be controlled by setting the center and radius of a virtual sphere. This opens up a lot of possibilities. The shader can be edited through Amplify Shader Editor and contributions to the project are always welcome! Project developed using Unity 2017.4.8f1. Please use this version if you are planning on contributing. You can work on your own branch and send a pull request with your changes. You can also just download a unitypackage from the releases tab and easily import everything to your project. This will not download the media folder. Disclaimer: The scripts controlling the behavior of the examples provided are not optimized in any way and should only be taken as quick & dirty examples. Check the examples included in the project! These shader comes in two versions; SphereDissolve (cutout) and SphereDissolve. The former is the one we want to use if we just want to dissolve a mesh, while the latter allows us to dissolve into a secondary texture set. Position defines the center of our spherical mask, while Radius defines its radius. Noise scale and Noise speed specify the look of the border. The lower the scale, the rounder it will be. If we want the border to be completely static we should set the speed to (0,0,0,0). By activating the Invert toggle, we can invert the dissolve mask, which means the only visible area is now the one within the radius. Lastly, as with the standard shader, we can specify textures for the most common channels. 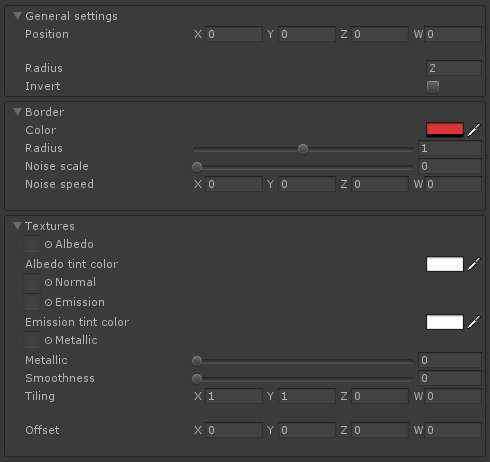 In the case of the “standard” version, parameters are the same, except we have two texture sets. This version of the shader can be used in a clever way to simulate a variety of effects! This piece of software is offered for free because I believe the gamedev community can benefit from it, and it should not be behind a paywall. I learned from the community, and now I am giving back. If you would like to support me, donations are very much appreciated, since they help me create more software that I can offer for free.